The power of a superstar can never be underestimated. Viswanathan Anand [Images] did it for chess, Sania Mirza [Images] is doing it for tennis in India. Apart from making the game popular they have galvanised a generation to pick up the sport, infuse confidence, given a reference point. Baichung Bhutia has been the face of Indian football for long. Now, a 23 year old who answers to the name of Sunil Chhetri looks ready to take on the mantle. "It's a great compliment for me," says Chhetri, who was named Indian NFL player of the year last season after scoring 12 goals. "I don't believe in all the comparisons but the expectations have definitely increased. There is the pressure to perform; it only pumps me up to do better whether I am playing for the country or club." The suave, energetic player from Delhi, who speaks faster than he dribbles the ball, is, like Bhutia, a fleet-footed striker with a boyish face and floppy hair. Like Bhutia, he has his roots in the foothills of the Himalayas -- his forefathers came from Nepal. "He has the talent to make it big," says JCT Coach Sukhwinder Singh. "Whether he will remains to be seen," says Singh, whose team's colours Chettri currently dons. "We have to understand that people like I M Vijayan and Bhutia played consistently at that level for a long time. 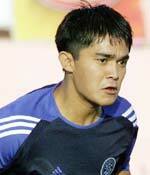 Chhetri has to do a lot and work harder." "(As strikers) you can't compare Bhutia and Chhetri. Bhutia is more explosive; they are two different, class players." Singh took Chhetri under his wing more than two years ago when he came to JCT after three seasons with Kolkata giants Mohun Bagan. "I didn't have to change around with his style; all I told him was what to do and what not to do with the ball. When you talk of skills, there are two parts to it: one is basic talent and second is decision-making. We have helped him in decision-making, the tactical side, and improving his concentration." "He has football in him," added the JCT coach. "I had football in my blood, since my parents also played it," Chhetri says. "When I started playing football I wasn't aware of the format or what the future holds. It was just a passion; I didn't work too hard for it." First it was the passion; when he played for Indian schools it was "for a certificate", and then it was the money and fame that made Chhetri stay with football. "Five hundred bucks pocket money for a 17 year old is not bad!" he exclaims at the memory, when he was thrust into a professional set-up when he signed with Mohun Bagan in his teens. "Till then I didn't know football was so big. When I was playing for Indian schools they (Mohun Bagan) saw me and called me for trials. That time it was just fun, but in the past two, three years I have started taking the game very seriously." Just like the club call-up, an India call-up happened to Chhetri early. "That felt like a dream come true. I think wearing an Indian jersey, whichever sport you play, gives a different high. Playing in the senior team is a great change, the teams are tougher -- that's where the big boys play!" "Earlier, I used to be too excited and thrilled and nervous just to be playing in the team. But now that the expectations are greater I am working harder." For a person whose "dream came true" at 17, he is startlingly realistic. Ask him about his European (the ultimate in football) ambitions and he replies sheepishly, "Indians can't choose! I'll take whatever they give me." After some pushing, he comes up with an answer: "Barcelona!" "I am not thinking too much about it. I want to go out for sure; I am preparing a CV to send out. There are so many things to learn." Though he laments that not many people recognise football players beyond traditional centres Kolkata, Goa [Images] and Kerala [Images], Chhetri says it is time the players, media and public give up the blame game and come together. "The Nehru Cup was a huge tournament. Football is not very popular from where I come, but the stands were full during the matches. Every time I scored the crowd would go crazy. Zee Sports did a great job telecasting that tournament. It just shows that for football to develop everyone has to come together." "We are all to be blamed for the condition of the game in India. Football is the best game, it's enjoyed all over the world, but it's not given due respect in India." "If people stay awake to watch a Chelsea versus Manchester United game late at night, I am sure they'll appreciate if we play good football. Even I would love to stay awake and watch Baichung Bhutia play. We need the right players, the right media, the right television coverage, grounds, jerseys; combine all departments to do well." Apart from his obvious ball skills, Chhetri's understanding of the arena he operates in is different from the normally myopic football vision. He voices his concerns without an edge of cynicism, and is ready to work on the solutions. He has the game, the attitude and the marketable 'X' factor. 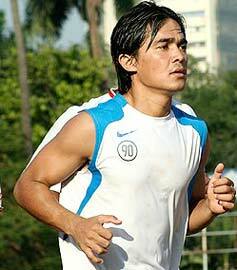 Move over Bhutia, Chhetri is here!